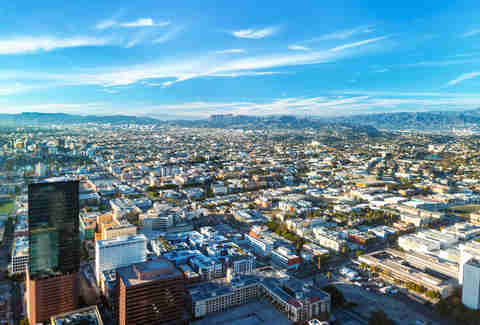 Whether you’re moving to the city for the first time or you’ve simply gotten sick of your roommates, looking for a new place to live in LA is both exciting and exhausting. Because we’ve got hundreds of neighborhoods and districts in LA County, it can be more than a little daunting to pick one. Here we break down over 24 of the most popular areas, highlighting the stuff you really care about (like rent, vibe, transportation, bars, restaurants, and what the burrito scene looks like) so you can pick the perfect one for you and all your cats. You’re welcome. Transportation situation: Atwater’s situated right at the 5, which easily connects to the 134, 101, 170, and 110. This means easy access to, well, anywhere. 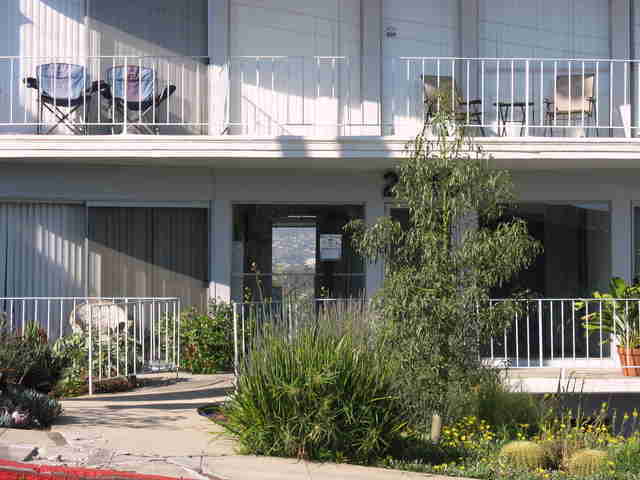 To get to northeast LA or any other eastside hotspot, you won’t even need to take the freeway. If Atwater Village was personified, it would be your friend’s cool parents. It’s a little bit more removed from the party vibe of Silver Lake and Los Feliz, but that doesn’t mean you can’t get funky if you want to. It’s one of the few neighborhoods in LA where every single house looks notably different from the one next to it; imagine the Sunset District in San Francisco, with houses of different colors and shapes (some even with castle-like turrets) everywhere you look. Most residences are older and maintain a sort of ‘20s-ish feel. As one of LA’s most diverse neighborhoods, Atwater Village makes for a fun multicultural playground. You’ll find family recipes at Tacos Viva Azteca (get the tongue), delicious pupusas on the cheap from El Buen Gusto, and even a tasty restaurant in the back of India Sweets & Spices, an Indian grocery store. Glendale Boulevard is loaded with great restaurants (Dune and Proof Bakery are pure magic), upscale places to drink, and even a swanky dive bar (Tee Gee). You’ll find a similar lineup along Los Feliz, with The Griffin, The Roost, taco trucks, and LA’s best restaurant Del Taco. The coffee scene is kickin’ too -- at Black Elephant Coffee, they donate a portion of their proceeds to protecting wildlife (so if you’re going to drink coffee, you might as well be a good person while you do it). Transportation situation: Traffic isn’t great, but you have easy access to the 101 and 10 freeways. 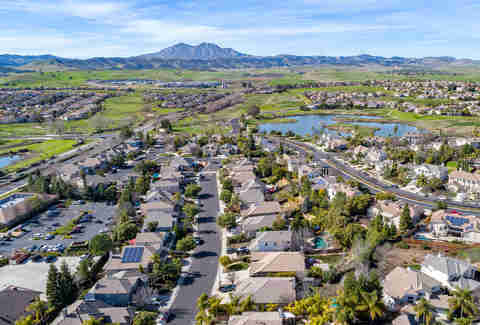 You’ll have a pretty easygoing straight shot towards most other neighborhoods that you won’t even need the freeway for. Beverly Grove, that hard-to-define stretch of greatness connecting West Hollywood to Beverly Hills to Fairfax, is a beautiful monstrosity with some of the best that LA has to offer. The Grove itself, regardless of what you think of it, is a very LA experience: a gigantic outdoor mall that’s home to a number of popular restaurants (like 189 by Dominique Ansel), a movie theater, and even a Barnes & Noble (they still exist!). Your favorite part of the Grove, though, will be the Farmers Market: an outdoor marketplace full of tasty food stalls and novelty shops (shoutout to the store that sells only hot sauce). The area beyond the mall is also a food and drink haven, showcasing restaurants and small plate bars that the whole city clamors to get involved with. Unstoppable chef team Jon & Vinny have set up shop here, slinging food from three titans called Animal, Son of a Gun, and the eponymous Jon & Vinny’s. As far as the bar scene goes, find your way to Phoenix for a not-dumb lounge, as well as The Roger Room before or after a show at Largo. Or both. In the mood for a Jewish deli? Canter’s is one our most famous, and though they may not have the best deli food in the city, they certainly have one of the best bakeries (good luck not ordering 10,000 pounds of rugelach). Directly next door is the Kibitz Room, where little-known bands such as The Wallflowers and the Red Hot Chili Peppers got their start. Cal Mare is red hot as well, serving up Italian seafood and fresh pasta -- you will end up there a lot. Transportation situation: Similar to the Beverly Grove situation, but with less traffic. If you live in Beverly Hills you can probably just use your private helicopter to fly you wherever you need to go. Elderly movie producers, your friend’s grandparents, Jed Clampett... they all live in Beverly Hills. If you’ve never been, it’s exactly how you’d picture it; lavish, rich, and clean. It’s the sort of place that reminds you that yes, some of the people who moved to LA to achieve success in TV, film, and music actually did. Is it an embarrassment of riches? Yes, absolutely. Is it also a living testament to the Los Angeles dream that makes us all work a little harder and hustle a little stronger? Yes, absolutely. Shopping on the legendary Rodeo Drive is alive and well; with top designers and luxury items galore, this is where rich people go to do rich people things. But for all the glitz and glamour, the place is surprisingly neighborhoody. You’ll find a younger crowd at The Troubadour, right on the border of West Hollywood and Beverly Hills. One of LA’s best music venues, The Troub consistently draws crowds for intimate performances by smaller local bands, as well as A-list acts like Guns N’ Roses. For a long time, Beverly Hills was the epicenter of fine dining in Los Angeles. Downtown’s culinary explosion has lessened it a bit, but some of the most impressive dining experiences are still found around here: Fogo de Chão, which can only be described as the Disneyland of churrascaria, as well as Wolfgang Puck’s best restaurants (Cut, Spago, Wolfgang’s Steakhouse). Also in the game are Urasawa, Sasabune, and Ginza Onodera -- all life changing/wallet-busting omakase sushi experiences. You can tell yourself you’ll resist the over-the-top trendiness of Urth Caffé, but you won’t, and the same goes for Aharon -- a charming coffee shop grinding some of the best beans around. Bibo Ergo Sum is a stunner, as well, with a secret(ish) entrance leading to a beautiful space full of no-joke cocktails. Transportation situation: You can practically smell the 405 and the 10. The Expo Line is finished and ready to roll too, so you can take that all the way from Santa Monica to the heart of DTLA. In the ‘20s, Culver City was home to Metro Goldwyn Mayer, making it one of the biggest studio areas in Los Angeles. Much of it still stands today, but has been incorporated into Sony and Columbia Pictures (one of LA’s biggest studios). A lot of Sony & Columbia employees have settled over here, trying to avoid what would otherwise be a hellish commute. Culver City is big and expansive, so for a long time it wasn’t exactly full of hip and trendy things -- butl like almost everywhere else in the city, though, that’s starting to change. A huge outdoor mall called Platform proves this, featuring everything from a SoulCycle studio, to an art gallery, to a taqueria called Loqui that will blow your mind. For drinks, you’ll frequent Oldfield’s Liquor Room and Bigfoot West. We have an extensive Culver City restaurant guide for you -- but probably the most notable thing about Culver City right now is Vespertine. Jonathan Gold just named it the best restaurant in Los Angeles, dethroning the four-time defending champ Providence. The tasting menu will cost you an arm and a leg (dinner for two will cost, like, $1,000) all the while making you feel like you’re in space. JGold says when you’re at Vespertine “You may as well be on Jupiter.” Does this sounds like something you’d be into? Take some time to decide, but in the meantime, you can head across the street to chef Jordan Kahn’s other restaurant Destroyer. The food is wonderful, not nearly as expensive as it should be, and no less Chef’s Table-y in presentation. Transportation situation: A stone’s throw from the 110 and the 10, which can take you to the 101, 5, and 710. The Red & Purple Lines run here, and they can take you right into the Valley and Koreatown, respectively; the Gold Line hits Downtown; and the Blue Line also starts here, so you can ride that bad boy all the way to Long Beach. The eastern section of DTLA is called the Arts District, and as more and more new things open around there, it’s hard to deny it may be the “coolest” area of LA. In the last few years, it’s blown up as a total craft beer palace. From places like Westbound where the word “gastropub” doesn’t even do it justice, to Everson Royce Bar & Bestia (which many people consider to be the best restaurant in Los Angeles), to the booming arts & design community, the Arts District is impossibly hip and impossibly hard not to fall in love with. Some of our most decorated chefs have opened restaurants in beautifully designed spaces here (like Spring, Redbird, Shibumi, Q). Something less beautifully designed, but no doubt the prize of the Los Angeles dining scene: Grand Central Market. Inside, you’ll find an excellent mix of generations-old food stalls next to brand new wonders like the illustrious Eggslut. Little Tokyo, a section of Downtown, is exactly what it sounds like: a Japanese food mecca. Lines down the block will form for places that deserve it (Marugame Monzo), directly next door to restaurants that probably don’t deserve it (Daikokuya), while other lines form in a deli-style huddle in front of the door (Kula). Robata, ramen, udon, sushi... you name it, Little Tokyo has it. Transportation situation: You’ve got the 5, 101, and 110 all under your belt, so you can easily get Downtown or head to East LA. 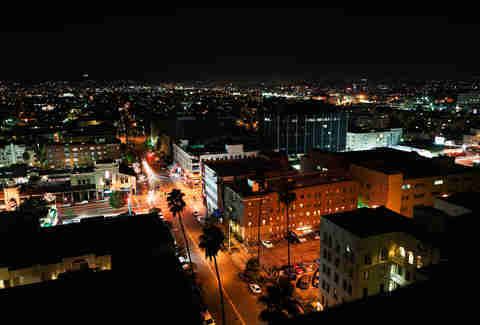 Sunset Boulevard provides a straight shot towards Hollywood and the west side. Just southeast of Silver Lake sits Echo Park, a neighborhood built around its namesake lake. (Couples flock to said lake to rent pedal boats, it’s actually one of the best date spots in LA.) Echo Park is hipster-y -- almost as much as Silver Lake, in fact -- but it’s also fun as hell and lush with history, easy-going people, and a ton of great stuff to eat and drink. And to top it off, it’s still not as expensive as it should be (yet). Restaurants, bars, and cafes flourish on Sunset Blvd, stretching all the way to the edge of Chinatown and DTLA; Guisado’s is doing it big with chef-driven tacos, and Button Mash is doing it even bigger with a bar/arcade full of excellent craft beer and Asian small plates. Mohawk Bend is another excellent hang, a big gastropub with one of the best beer lists in town (they generally have Pliny on tap); beer lovers will split their time there with Sunset Beer Co, while wine lovers can head across the street to Bar Bandini. Coffee nuts will set up their second home in Woodcat, Eightfold, Triniti, or any of the other craft coffee spots along Sunset Boulevard. Echo Park is fun as hell. There’s a huge Cuban presence in Echo Park, too; tons of Cuban immigrants and refugees settled here after Castro overthrew Batista in the ‘60s, and the influence of that influx can be seen in landmarks like José Martí Square, and the annual “Presencia Cubana” heritage festival. There are also Cuban bakeries (chief among them Cuscatleca), sandwich shops, and cafes everywhere you look; think of Echo Park as a tiny slice of Miami in Los Angeles. Transportation situation: The 5 and the 2 are very, very close. The LA River Bike Path runs along the border of Frogtown too, so you can walk or bike pretty much anywhere around the neighborhood. 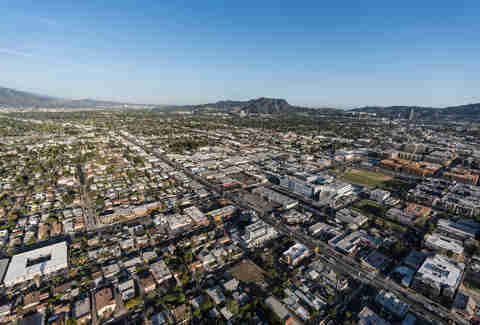 Whether you call it Frogtown or Elysian Valley, this area’s a definite contender for the most up-and-coming neighborhood in Los Angeles -- and whether that’s good or bad, we’ll let you decide. It sits along the LA River (which is a thing), making it one of the most bikeable and walkable areas of the city. The warehouse-heavy neighborhood is just waiting for development; La Colombe Coffee just opened their LA flagship location in one, and Frogtown Brewery (a fun mom & pop beer operation) also operates out of a warehouse. No matter what you do in Frogtown, make sure your first stop is Wax Paper, a tiny shipping container serving some of the best sandwiches you will eat anywhere. Nearby, you can have a beer while you get your bike fixed at Spoke Bicycle Cafe, dance your face off at Zebulon, or end up at Salazar for arguably the best Paloma in LA , and some tacos served on tasty homemade tortillas. We love you, Frogtown. Transportation situation: The 134 is your guy, and occasionally, so is the 2. 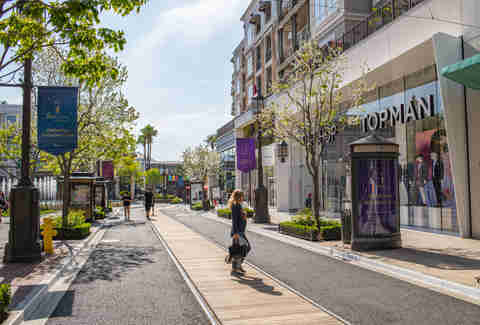 Brand Boulevard runs the length of the bustling section of Glendale. Fingers crossed for a Glendale Gold Line stop one day. Sometime in the last few years, Glendale saw an explosion of cuisines that unquestionably transformed it into one of LA’s best places to eat. Because of this, Glendale is a prime example of the gentrification that persists throughout LA; as more and more old-school Glendale businesses close, new ones spring up. Nishi-ya, for example, is a top-of-its-class omakase experience, and Brick & Flour serves up fantastic Mexican food with artisanal flour tortillas, but neither of them opened before 2005. Despite the decline of old Glendale businesses, classic Armenian food isn’t gone. Mini Kabob, a family run operation serving elite-level grilled meats, is still going strong despite being literally the smallest restaurant in Los Angeles. Adana still makes probably the best dolmas in the city, and Rockbird is combining both worlds, serving up flame-grilled Cornish Hens with Lebanese/Armenian-meets-American-BBQ flair. Glendale’s burst of growth (especially on Brand Boulevard) is also due to The Grove’s little sister, the Americana Center. Only a few years ago. the most exciting thing at the Americana was Urban Outfitters. Today, between openings from places like Bacari, Lemonade, Din Tai Fung, Katsuya, and The Tsujita, it’s hard to pick just one restaurant to be the most exciting. Just down the street (and only a few blocks from In-N-Out) sits a Shake Shack, a Mainland Poke, and an Eggslut; name something popular, and it’s probably at the Americana. Transportation situation: You’re sandwiched between the 5, the 2, and the 110. Northeast LA (or NELA as it’s sometimes known) has packed a ton of smaller neighborhoods through its borders -- Glassell Park, Highland Park, Mount Washington, Eagle Rock, and more -- so driving to each one won’t take more than a few minutes. Highland Park has a Gold Line stop, too, so you can go towards east LA or all the way out to the San Gabriel Valley. People have probably told you that Highland Park is wonderful -- this is because it is wonderful. It’s actually hundreds of years old, officially incorporated into Los Angeles back in the 1780s, and because of this rich history, there aren’t many other places in LA where you’ll see such a special mix of old and new. The area’s demographic has been largely Latino since the ‘60s, and you’ll find longtime Highland Park families running barbershops, food trucks, bakeries, and a zillion other local businesses. 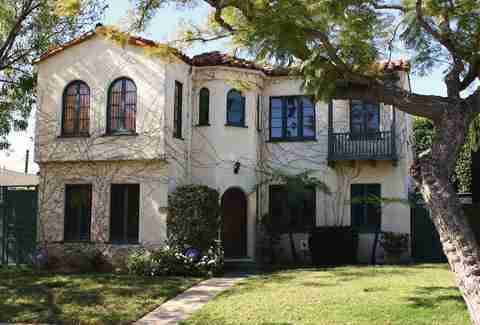 You can truly feel the history of the neighborhood when you walk through Highland Park -- but like the rest of LA, no area’s immune to change forever. One person’s development is another’s gentrification; rents are climbing for residents and businesses alike, and despite public outcry many old-school, Latin-owned businesses have been priced out in favor of trendy places to eat and drink, especially along York Boulevard & Figueroa Street. With change comes the bad along with the good: Highland Park Brewery is arguably the best brewery in LA, and Tin Foil Liquor & Grocery serves beer up front and spectacular sandwiches from chef Jeremy Fall’s secret deli in the back. Highland Park Bowl recently underwent a $2,000,000 renovation, and is by far the best-looking place to bowl in LA (apologies to Spare Room). The terrific cocktails and wood-fired pizzas are only the icing on the cake. 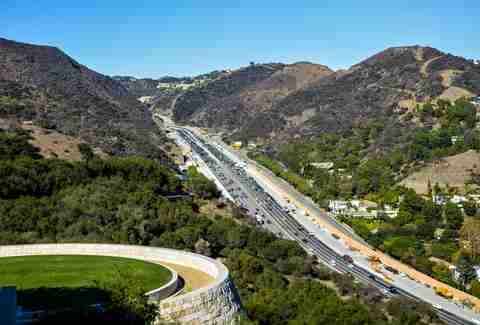 The rest of NELA is a sprawling landscape full of restaurants, bars (legend speaks of a secret, invite-only speakeasy in Glassell Park called The Stubborn Nail), Occidental college students, and hikers (the nearby Verdugo Mountains are beautiful). If you’re into farmers markets, Highland Park and Eagle Rock have two of the best. Put Division 3 and Casa Bianca Pizza Pie in heavy rotation too, while you’re at it. Transportation situation: You can grab the 101 fairly easily, but beware of the almost-permanent traffic. The Red Line runs through a good portion of Hollywood too, so you can take that Downtown, up North Hollywood, or into Koreatown. Is there a more famous neighborhood in the country than Hollywood? This area’s everything you think it is, yet so much more. Yes, it’s Grauman’s and the El Capitan and way too many bad nightclubs, but it’s also the physical manifestation of everybody who has ever chased a dream in the entertainment industry. It’s a living, breathing beast that shows it’s possible to achieve success from nothing. No matter how obnoxious and touristy Hollywood gets, somehow it manages to keep that old magic spark. East Hollywood, West Hollywood, and (regular) Hollywood have distinctly different vibes. West Hollywood is LA’s gay capital, so you’ll find some of the liveliest party-areas around, whereas East Hollywood is a lot more relaxed and low-key (with a combination of the two in Hollywood). When it comes to the dining scene, where do we even begin? The area is gigantic, and speckled from end to end with great food. Rosaliné just landed itself on our radar as one of the best new openings in the city, so head there in a hurry for some of the best Peruvian food of your life. We can’t get enough of Baroo either, an East Hollywood strip-mall spot specializing in experimental Korean grain bowls and fermentation. To be honest, just name a cuisine, and you’ll find somewhere excellent to eat it in Hollywood. Mind-blowing Lebanese and Armenian food? Hit Marouch. Next-level French cuisine? Go for any of celebrity chef Ludo Lefebvre’s Trois restaurants. There’s a limitless bounty of food and drink around here (and our full Hollywood restaurant guide goes into greater detail). 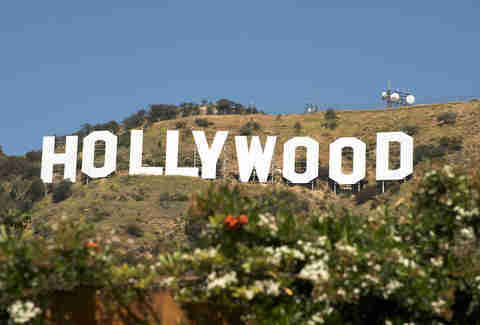 Above all, though, Hollywood is famous for being the capital of the entertainment industry. It’s not hyperbole; this is where most of your favorite stories go down, and it has been for over 100 years. There are studios everywhere -- including Netflix and Paramount -- and chances are, whatever building you’re looking at has a team of people working in film or TV... which makes for equal parts celebrity spotting, and the world’s worst traffic. Transportation situation: The 101, 110, and 10. You’ve also got the Purple Line running along Wilshire, which easily connects to the Red Line (and, rumor has it, will make its way toward Beverly Hills soon). Korean immigrants began to settle and open businesses here in the 1960’s, taking advantage of the inexpensive real estate. What probably cemented Koreatown as its own tight-knit community though, were the LA Riots -- residents famously claimed they felt ignored throughout, which created a “let’s stick together” kind of vibe, and it’s been that way ever since. Today the neighborhood has the largest Korean population outside of Korea itself, and is packed to the gills with cheap dive bars, karaoke, and an absurd number of restaurants. God-king David Chang himself even called it one of the most exciting places to eat in the entire country. For essential Korean BBQ, you’ve got Park’s BBQ, Kang Ho-dong Baekjeong, and Soowon Galbi (and probably 500 others); for life-changing soondubu-jjigae (tofu stew), you’ll want to hit Beverly Soon Tofu. Of course, there’s more to eat in Koreatown than just Korean food -- Cassell’s Hamburgers is proof of that, serving one of our favorite old-school burgers in town. Finish it all up with a cocktail experience not so different from an omakase sushi meal at the Walker Inn. In addition to the bounty of places to eat, you can catch a show at The Wiltern, go bowling at the supremely cheap Shatto 39 Lanes, or find your way into a password-only karaoke spot after-hours. Add to all this K-town’s extremely central location, and what you end up with is a truly wonderful neighborhood. Good luck finding a parking spot, though. Transportation situation: There are no actual freeways in Los Feliz, but the 101 is close by in Hollywood, and the 5 is close by in Atwater Village. Public transit is solid, as the Red Line hits Vermont & Sunset and Vermont & Santa Monica, making it super-easy to head to Hollywood or DTLA. However you choose to pronounce it, there’s nothing to hate about Los Feliz. Alright, the parking is admittedly not great, but Los Feliz has a strong shot at the title of Best LA Neighborhood -- and it’s one of our favorite places to spend a weekend. 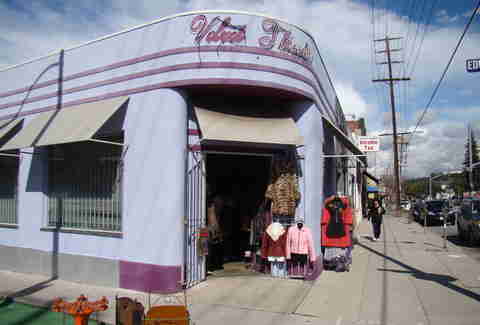 Hillhurst and Vermont Avenues make up most of the hustle and bustle, lined from top to bottom with shops, restaurants, and bars. 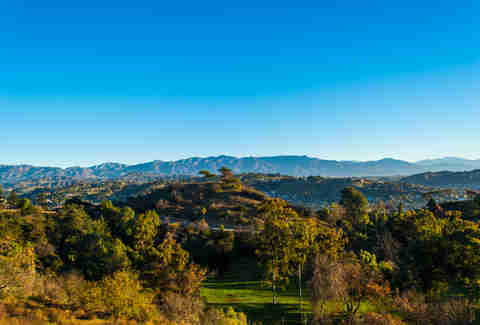 Griffith Park, one of LA’s ultimate landmarks, is probably the area’s defining treasure (it’s one of the largest parks in the country, even bigger than Central Park). Griffith Jenkins Griffith acquired the land in the late 1880s and turned it into an ostrich farm, which sounds made-up but is indeed true. 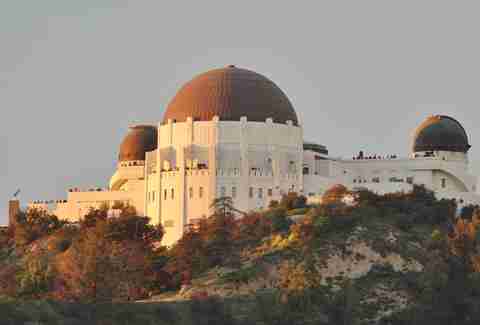 Today, the Griffith Observatory sits at the top and attracts tons of visitors every damn day. It’s hard to go wrong in the eating and drinking department around here; grab some cheap-as-hell/delicious-as-hell fish tacos from Best Fish Taco in Ensenada, an Italian sandwich from the family-run Rocco’s Deli, or some $1 oysters at Messhall on Tuesdays. Ye Rustic Inn is the dive bar of your dreams, and might just serve the best Buffalo wings in LA. If you’re of the tiki bar persuasion, wander over to the legendary Tiki Ti. And when all else fails, head to one of our favorite spots for live music, dancing, and top-notch mixology, Harvard & Stone. The crown jewel of Los Feliz, though, might just be Kismet: a Mediterranean grand slam serving everything from radicchio tarts to lamb belly and marinated mussels. It’s also one of our picks for the best LA restaurants that opened in 2017. Los Feliz includes Thai Town as well, which is exactly what it sounds like: an area that’s home to much of LA’s Thai population, and consequently a Thai food haven. Most residents have a favorite spot picked out, generally describing them as “the one in the corner of the strip mall,” especially since they tend to stay open long after bars close. You’ll know you’ve found a great late-night Thai spot when you find the staff doing karaoke until 4am while you eat. Sapp Coffee Shop, a JGold favorite, is a cash-only institution with rock-solid jade noodles. You really can’t go wrong anywhere, but we love Ruen Pair, Thai Patio, and probably the best of all, Jitlada. Transportation situation: The 210 and 134 will be your lifeblood, but the 134 will also get you to the 101, the 170, and the 5, so that’s somethin’ special. Add to that the Gold Line, which can swing you around towards East LA or the supremely up-and-coming Chinatown, and you’re set. Pasadena is the biggest section of the San Gabriel Valley, a vibrant community full of families, restaurants, and -- since JPL is here -- rocket scientists. The Bruins play at the Rose Bowl making it a UCLA hotbed as well, and if you’re as big a fan of Back to the Future as the author of this article, you’ll be pleased to know that the Gamble House, aka Doc Brown’s house, aka one of LA’s coolest attractions, is here, too. 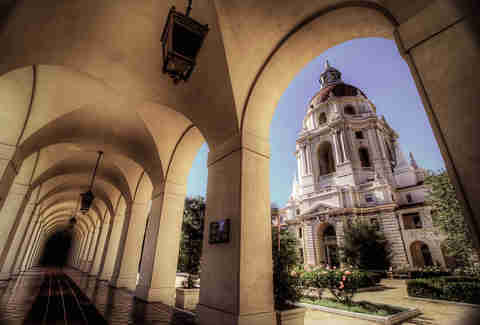 Old Town Pasadena is actually the opposite of what it sounds like, as a lot of it is brand new. 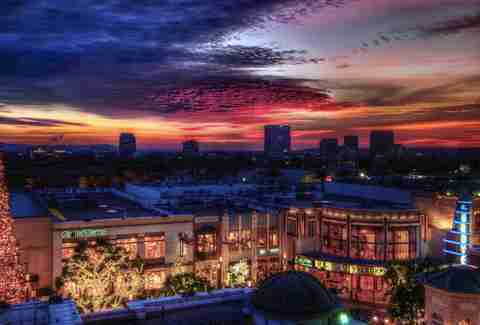 Colorado Boulevard is home to the bulk of Pasadena’s shopping, dining, and drinking. Ramen Tatsunoya draws a huge crowd and 800 Degrees Pizzeria keeps the dream of chains-with-great-food alive. We’re completely blown away by Lost at Sea (especially in the presentation), and Jonathan Gold loves Union and Osawa, which means you probably will too. Are you a whiskey snob? Don’t skip on the Blind Donkey, a speakeasy with one of LA’s top-level whiskey collections. The rest of the San Gabriel Valley is an entirely different beast. You simply cannot say you’ve eaten Chinese or Sichuan food in LA until you’ve done some damage in the SGV -- there’s a good spot almost every five feet. Chengdu Taste, Sichuan Impression, and Shanghai Dumpling House are all places you should be marking down regardless of what neighborhood you live in. There aren’t many places where you’ll eat like this in LA... maybe even in all of California. Transportation situation: The 10 -- probably the most fear-inducing freeway in LA. Don’t bother having any friends on the east side, because sometimes driving to San Francisco seems more pleasant than hopping on the 10 and dealing with that traffic. 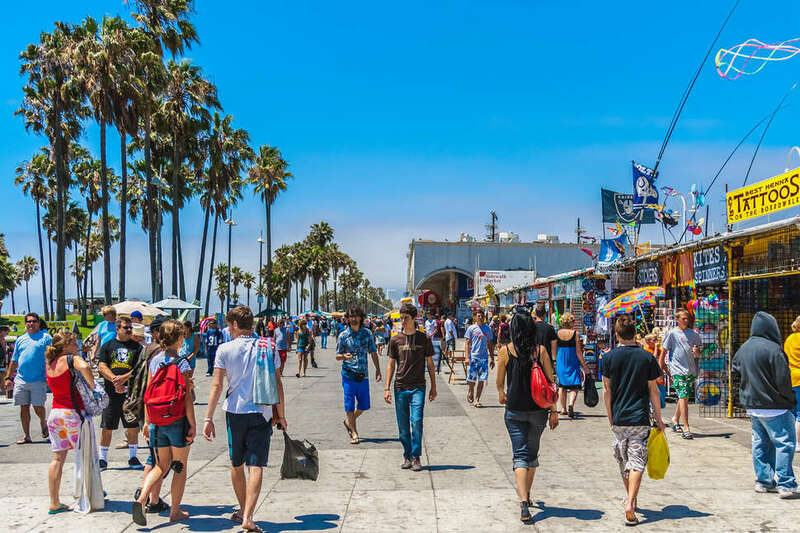 The west side beachfront neighborhoods of Santa Monica and Venice have become some of the richest areas in the city, and probably what most out of towners picture when they think of LA. Sure, Venice is full of weed “doctors” and lame kids trying to make skater videos, but it’s also full of White Men Can’t Jump-style pickup games, the quaint stretch of shops and galleries on Abbot Kinney, and some of the most exciting restaurants and bars. Case in point, Evan Funke’s Felix: one of our picks for 2017’s best restaurants in the entire country (with Funke himself named LA’s best chef of 2017). It’s pricey, so if you’re inclined to go the opposite direction, there’s always for a cheap lunch at Hinano Cafe (Jim Morrison’s favorite haunt), a dive bar serving what a lot of people consider to be one of the best burgers in town. 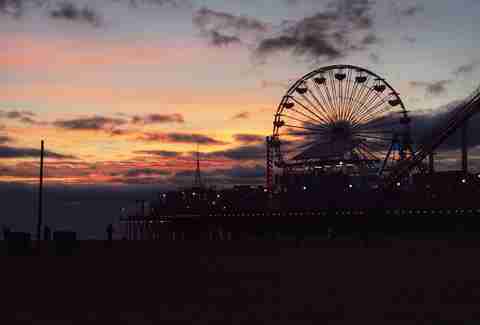 In Santa Monica, it’s equally as packed with chaos and beauty. The SaMo restaurant landscape is Jonathan Gold 101ers like Cassia and Rustic Canyon, as well as smaller gems like Cha Cha Chicken. Families both local and vacationing flock to the beach each day to take advantage of the movie-esque Santa Monica sunshine. You’ll find some of the nicest hotels down here too, (like the Viceroy) just a few blocks from goofy restaurants like Jimmy’s Famous American Tavern (where you can get a Bloody Mary garnished with bacon, blue cheese, shrimp, pepperoni, jack cheese, pepperoncini, and a jalapeño deviled egg... yeah.). The weather’s at least 10 degrees cooler. The beach is at your fingertips. Why wouldn’t you want to live here, you ask? Well, because the rent’s preposterously high, and (maybe even worse) you’d have to take the 10 any time you wanted to go to the Eastside. Now you understand the conundrum. Transportation situation: The 101 cruises underneath Silver Lake, but sometimes the traffic is so awful that you might as well take Sunset if you’re going Downtown. In fact, just take Sunset if you’re going Downtown. It’s easy to write Silver Lake off as annoying due to the overabundance of hipsters, but there’s no denying the excellence this neighborhood has to offer. Despite being trendy as hell, it still has a ton of (so far) not-whitewashed international restaurants: Same Same Thai is a perfect example, a sleek wine bar rocking a menu full of old-school family recipes. Pine & Crane -- a shockingly inexpensive Taiwanese small plates spot -- will change your life, while just down the road you can pop into Freedman’s, an exciting Jewish deli serving elevated versions of the classics you love. You’ll find a legendary family-run Cuban cafe (Café Tropical) right next to a popular ramen shop (Silverlake Ramen), all just a short walk from flower shops and community theaters. Though it feels like Sunset Boulevard is the most prominent area of Silver Lake, that’s not actually the case; there’s still Silver Lake Boulevard, a winding stretch that plays host to Kismet-competing restaurants like Botanica, the Silver Lake Dog Park, and everybody’s favorite place to run, the Silver Lake Reservoir. Almost as trendy as running around the reservoir is hanging out at one of Silver Lake’s many coffee shops; Dinosaur is a local favorite (double points for the rockstar food trucks that park outside). Transportation situation: Easy enough access to the 405 and 110, in addition to the Green Line, which can take you all the way to Downey and Norwalk. The Blue Line can also take you from Long Beach into the center of DTLA. The entire South Bay area has a pretty universal pros & cons list, so we’re grouping it all together for the purposes of this guide. Pro: You’re near the beach. Con: You’re far from everything else in LA. Pro: You’re really close to Orange County. Con: You’re really close to Orange County. (Admittedly, distance from LA isn’t the biggest deal as you can take the train all the way from Long Beach to DTLA. 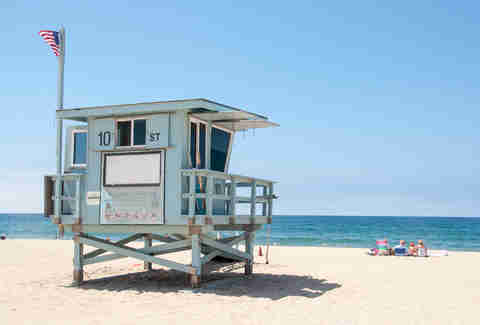 Places like Hermosa, Redondo, and Manhattan Beach are beautiful. Beachside dining and drinking is plentiful (check out Love & Salt, Manhattan Beach Post, and Baran’s 2239), and the sunsets are completely ridiculous. 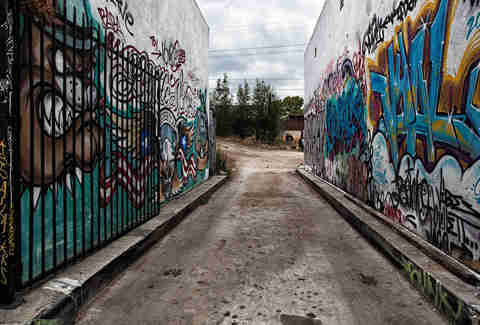 More inland areas like Torrance and Carson are, well, not as beautiful, but no more lacking in character. Torrance is also home to some of LA’s best breweries -- Smog City, Monkish, and Strand to name a few. Long Beach is probably the most LAish spot in the South Bay. Rooftop hangouts like BO-beau give off a DTLA feel, and LA institutions like Beer Belly and Gus’s Fried Chicken have secondary locations down here. We love Lola’s, too; a homey Mexican restaurant, with homemade salsas to write home about. The Queen Mary, a retired ship that plays host to tons of events every year, calls Long Beach home as well -- find an excuse to watch fireworks here, because they will blow you away. Transportation situation: Public transit essentially doesn’t exist here, so let the 101, 5, 405, 118, and 170 freeways be your guide. Ventura Boulevard (yeah, the one Tom Petty mentioned) also serves as an unofficial freeway, as it practically runs the length of the SFV. If there’s one thing that defines the food scene in LA, it’s strip malls. That might sound weird to an outsider, but any local knows top-tier restaurants are found in strip malls in seemingly endless numbers -- and perhaps nowhere in the city is this more prevalent than the San Fernando Valley. Valley strip malls are home to a ton of sushi bars that could compete with Tokyo itself -- Go’s Mart, for example, is a tiny, uninviting spot that features fish imported directly from the Tsukiji Fish Market. Some of the best Syrian food you’ll ever have will be in a strip mall at Kobee Factory. There’s a place in Valley Glen called Mom’s Bar-B-Q House serving up some of the most game-changing soul food in LA right in the corner of, yep, a strip mall. In the end, there are 20 bajillion great places to eat. Luckily, we’ve already laid out the best SFV restaurants for you right here. The Valley wasn’t “cool” for a long time, and while it’s not the burgeoning hotspot that, say, DTLA is, it’s still changing every day. North Hollywood might be the most exciting part, especially where Lankershim and Magnolia meet. The rows of bars, restaurants, and community theaters create a special atmosphere; people actually walk around. Burbank is a different story. Sort of a “Hollywood Pt. 2,” editing houses, color correction facilities, and a slew of studios (including Warner Bros, Nickelodeon, and Disney) are everywhere. The neighborhood’s packed with landmarks, and you can even visit the oldest Bob’s Big Boy in existence (should you so choose). Burbank was also once the home of Skunk Works -- Lockheed Martin’s infamous, top-secret weapons development program -- but that’s one piece of Burbank history you won’t find well preserved. Unlike most of the gentrification the rest of the Valley has seen, it doesn’t feel like Burbank has made much of an attempt to change into a trendy hotspot. At the family-run Pinocchio Restaurant they’ve been doing things the same way since the '60s; same deal at Giamela’s, a sandwich shop you will fall in love with. Sure, the “downtown” area’s a bit more bustling, but instead of celebrity chef-owned restaurants, the area is full of family-oriented stuff like movie theaters, shopping malls, and chains. Transportation situation: You’ll be taking the 405 and the 10, which means you’re going to spend most of your time sitting in nightmarish gridlock. Luckily, the Expo Line squeaks through the area, so you can take that out to the beach or east toward Downtown (and from there, connect to the Red or Blue lines). Westwood is best known as the home of UCLA. Student life dominates the area, and it’s unwise to wear any sort of USC or Trojan gear around here -- the rivalry is very real. It’s also home of Westwood Village Memorial Park, one of our most beautiful cemeteries (and the resting place of famous people like Marilyn Monroe and Rodney Dangerfield). Just south of where Westwood and Brentwood meet is Sawtelle, an area full of excellent Japanese food that somehow gets robbed of credit thanks to the existence of Little Tokyo. The appropriately named Killer Noodle, from the wizards behind The Tsujita, specializes in insanely spicy ramen. The place will annihilate your tongue to ash, and we highly recommend it. Is it enough to outweigh the insane traffic, especially if you’re anyone other than a UCLA student? Maybe not. Wilder Shaw ate at Best Fish Tacos in Ensenada two times during the course of writing this post. Do not contact him on Instagram or Twitter to say you like Ricky’s Fish Tacos better.